« Suicides: Can God save Anthony Bourdain and Kate Spade? Mazal Tov! Heifer Born, But Not All Red: Two calves were born this week, under the auspices of the Temple Institute’s Raise a Red Heifer in Israel program. One calf was a bull, making it ineligible for candidacy as a red heifer. The most recent birth was, indeed, a female (heifer), but she bears a small patch of white hair, disqualifying her from candidacy as a red heifer. Two calves were born this week, under the auspices of the Temple Institute’s Raise a Red Heifer in Israel program. One calf was a bull, making it ineligible for candidacy as a red heifer. The most recent birth was, indeed, a female (heifer), but she bears a small patch of white hair, disqualifying her from candidacy as a red heifer. The Temple Institute’s Raise a Red Heifer in Israel program has so far supervised over half a dozen births, but still has not produced a candidate for the red heifer. A red heifer, as required by Torah (Numbers 19) must be completely red. Any non-red hairs disqualify the calf. So, the Temple Institute is still trying to produce a red heifer. Some consider cows are heifers after about six months. 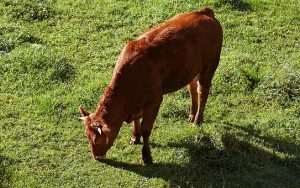 Whether it is under or over a year, a ‘red’ heifer is a female cow that is reddish brown in color which has not produced a calf. They mainly look brown, but with some reddishness. Certain Jews believe that God will provide a red heifer just before the Messiah will arise. 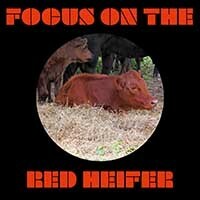 Some farmers are even raising cattle in the hope of providing the red heifer certain Jews feel is needed. Essentially some feel this is for a type of re-sanctification of the priesthood. Without that “red heifer” and/or the related sanctification, the sacrifices the Bible says will be stopped (Daniel 9:27, 11:31) cannot be resumed according to certain Jews. Thus, if the relevant Jews willing to sacrifice animals believe this is needed, the location of a ritualistically proper red heifer can be a major milestone in the sequence of end-time events. The fate of the world does not depend upon a red heifer being found, though at some point in time, at least one will apparently be pointed to as important. Jews have interpreted this to mean that another red heifer needs to be sacrificed for sacrifices to be resumed or for the Messiah to return. While that is not directly stated above, it could be implied from that scripture that one is again needed. And if those who want to sacrifice will not do so until they have a red heifer, then in that respect a red heifer is important. Some Jews tie the burning of scarlet in Numbers 9:6 to the above. Yet, while sins can be as scarlet, the Bible is not saying that this is related to a red heifer. It is a call from God to repent. And Christians do this without a red heifer (Acts 2:38) as it is not possible that the blood of bulls and goats could take away sins (Hebrews 10:4). Jesus takes away sins (John 1:36). So, according to one tradition, supposedly there have been only nine properly prepared ones and the tenth one is what is needed. Some have wondered if the abomination of desolation Jesus mentioned in Matthew 24:15, that Daniel spoke of, is the sacrificing of the next agreed upon Jewish red heifer. Let me simply state that no, it is not. That abomination has to do more with the final coming Beast of the Sea of Revelation 13 and not a sacrifice of the Jews. That belief is in error. An employee of the Temple Institute told me personally that his group did not believe that they needed a rebuilt Jewish Temple to resume animal sacrifices. He basically said that all they need is an altar, which they have, and permission from the Israeli government, which they expect will happen someday. Years earlier, a representative of the ‘reconstituted Sanhedrin’ emailed me and said the same thing (see Why is a Jewish Temple in Jerusalem Not Required?). So, not having a temple or red heifer will not stop them. It is my belief that once there is permission to start regular sacrifices, that whichever red heifer may be available then may be considered to be the right and acceptable one (even if it was not so before hand). The Bible shows that the Jews will again have animal sacrifices (cf. Daniel 9:27; 11:31) and the fact is that The Temple Institute and others are taking steps that will lead to the fulfillment of various end time prophecies (watch also The Red Heifer and the End of the World). Here is a link to our 2018 video on this subject: Red Heifers and the Fate of the World. The Red Heifer, Jewish Beliefs, and the End of the World The Temple Institute is watching a ‘red heifer.’ Why might this be important in the sequence of end time events? Here is a related link in the Spanish language Novilla roja descubierta en EE.UU. e Instituto del Templo está interesado en ella. Here are two related videos in English: Red Heifers and the Fate of the World and The Red Heifer and the End of the World. This entry was posted on Friday, June 8th, 2018 at 3:00 pm	and is filed under Religious News.